I realize this is about as productive as talking to a brick wall, but I’m going to explain some basic economics to statist French policymakers (oops, pardon the redundancy). Here’s how the Wall Street Journal described the proposal. The proposal…calls for reducing the amount companies contribute to the state-run health-care and pension systems. To make up for the lost income, the center-right government would raise France’s value-added tax—a levy similar to sales taxes in the U.S.—which is currently as high as 19.6%. …Mr. Sarkozy is expected to discuss the VAT proposal together with other job measures at a meeting with unions and business leaders on Jan. 18. At first glance, this seems to make sense. After all, won’t it help to shift the tax burden from jobs to consumption? If we look only at direct effects, the answer is yes. But if we channel our inner Bastiat and look at both the seen and the unseen, the answer changes. The key thing to understand is that people prefer leisure to work. The reason they get jobs, by and large, is to obtain the income needed to consume and enjoy life. As such, anything that expands the “tax wedge” between pre-tax income and post-tax consumption is going to impose similar levels of economic harm. Here’s a simple example. If I earn $100, does it matter to me if the government takes $25 as I earn that income (either with a payroll tax or income tax) or as I spend that income (either with a sales tax or value-added tax)? Is there any reason that my incentives to earn and produce will be altered by shifting from one approach to the other? To be sure, there are probably some short-run effects when government reshuffles the tax burden in the way Sarkozy is proposing. People don’t react instantaneously when policy changes. That’s presumably even more true when some taxes are disguised, which is definitely the case with both the VAT and payroll taxes that are collected at the business level. But transitory effects won’t solve France’s problems. The bottom line is that Sarkozy shouldn’t expect any permanent boost in employment if all he does is shift the collection point for a small portion of a large tax burden. If he really wants to improve the French economy, he should copy the Baltic nations and dramatically reduce the burden of government spending, while also replacing a punitive tax system with a simple and fair flat tax. But don’t hold your breath waiting for this to happen. The French people occasionally show signs of intelligence, but the political elite have no incentive to change a system that gives them wealth and power. I am French and my english is not good, but I would like to say that France are not lucky like the USA : we have not politics like Ron Paul. All french politics are etatist. My country are on the road of serfdom. Give the power to ron Paul to give an example for the world. Ahhh.. some people may want to attribute the growth due to access to credit. Rates may be low compared to historical rates, but rates are still double or triple most other countries and payment terms are much shorter. I’m like everybody else: I don’t like taxes. But I think that countries can do alright, even if they have high taxes if they can manage their finances well. Just take a look at Brazil, now the 5th or 6th largest economy in the world. Employment taxes & benefits – cost the employer on average 125% over the underlying salary. The government loves to mandate raises almost every year. The 2012 increase was just shy of 15%! But what can you do? Not everything can be automated. The idea of “independent contractor” was officially killed-off about a month ago by Brazilian politicians. Now, even someone working at home, out of the boss’ control must be registered and all employment taxes and benefits paid. There are already Tobin taxes in Brazil, and there is even a 7%+ tax on the consumer who uses a credit card outside of Brazil. There are so many taxes in Brazil that if someone saw them, their eyeballs would most likely pop out. I have yet to see a “true” complete list of taxes in Brazil on the internet. Maybe one of these days I’ll get around to doing that. Do all of these taxes affect the economy. Of course! The government is an opportunistic tax grabber. But I still can’t figure out HOW, despite so many oppressive taxes, the country can grow like it has over the last decade. Some might say FDI, but I see no traces of FDI in my everyday life, no matter how hard I look. This proposal would give them more money to save and improve capital-formation – increase the incentive not to just spend all their income. 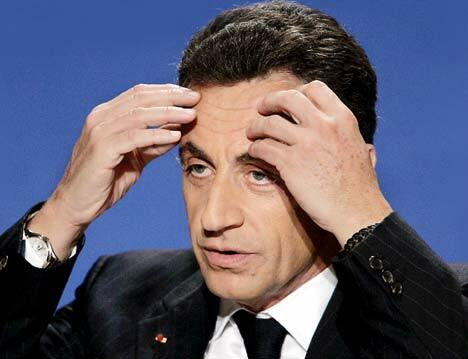 Seems like Sarkozy now realizes that payroll taxes are a bad idea! How about lowering them to zero! So it’s great news, and yes, a tiny step in the right direction. Yet it IS in the right direction. By shifting taxation from income to consumption, yes, there is increased tax flexibility on what to spend the remaining after-tax earnings on… but… this is negated by corresponding loss of tax flexibility on how to earn the income to pay for your purchases (i.e. choose higher taxed work vs. other forms of lower taxed contributions, like investment – though many people do not see investment, i.e. deferred compensation i.e. delayed gratification for past work, as economically beneficial, even though even Marx accepts so – but that is another story). The net change in flexibility is probably null. The shift from income taxation to VAT would simply remain a smoke and mirrors exercise that just buys the illusion of doing something and thus buys some voter hope-time to get past the next election. But assuming there even is voter demand amongst the French to do something revenue neutral, who really believes that ? In addition to being an illusory exercise in appearance to be doing something, when the details of the change are drawn, it will almost certainly be an opportunity to bring in more revenue through increased net aggregate taxation. In essence, French voters have “run out of other people’s money”. But the monster they fed and grew with that money is still alive and now very hungry! He is now inevitably turning against the very voter hands that fed it, towards those who once delusionaly hoped to maintain their western standard of living by hiring the monster to do the redistribution. With little left to eat from the top 20%, the monster has to finally dismember and eat the 80%, through VAT. Once the 80% are consumed, the monster itself will finally die – Europe in the 21st century is on the same trajectory as the USSR of the 20th century. Americans who support a European shortcut to prosperity are simply the useful idiots of the 21st century. Unfortunately this time they will win. BTW, there IS a REAL new hope, as a new VAT is emerging in Europe. Flat effort/reward curves lead to decline? Well, make em even flatter! Not to worry though, it will be only 0.1%. And unlike VAT and income taxes, it will never increase – even in difficult times, or, OK, if it does increase, it will be rolled back once Europe goes back to a sustainable growth trendline (ahem.. something perhaps comparable to the 4-5% world average?) — as if things in a European continent operating under such flat effort/reward curves will ever go back to sustainable growth on par with the world average. They are doomed and one of the dangers is that declining empires turn nasty in their death throws. If I were Swiss I’d be worried — and it also looks like a good time for an Iran distraction… while the Western world’s lemming voters are on their way to economic self-destruction. One more delusional trick, one more irreversible pact with the devil to keep alive the hope. “Because I hope that one day, just some day, the few remaining French competent and motivated people will produce more when they have been so far, so that they can also support my standard of living even more now. Just for a little longer, just until the relative comfort of my mediocre welfare benefits finally motivates me to go beyond lifetime choices of mediocrity, so that I can become exceptional and finally work to serve other people. Because under the mediocrity inviting incentives of the Welfare State I produce 3x what the average world citizen produces, BUT, I am accustomed to and want to hang on to a standard of living 5x the world average. So I must supplement the 2x difference through redistribution and, of course, hope that productive people will move to higher production, so that my declining welfare state country can continue to outcompete the three billion people of the emerging world on a five to one ratio. Apparently this has not worked, but I’m not giving up hope. I have at least one more card of hope to play at the polls as a citizen of a now larger EU. I will augment production dis-incentivising intra-country wealth transfers with cross-country wealth transfers. That surely will motivate Europeans as a whole to find ways to increase their production by 4-5% every year (on par with the world average) and avoid decline and convergence of European prosperity levels to the world average. Matt, yes I agree with the general theme of the post that moving from direct to indirect tax won’t fix the French economy. However the point I raise is where the author states “does it matter to me” [a consumer] “whether I pay tax directly or indirectly”, I think it’s worth considering that, in general, indirect tax provides greater consumer choice, and therein, from a consumer perspective, yes it does matter and there is a distinct difference. My personal view is a nation will be more prosperous in a low direct-tax economy as it puts greater financial power into the hands of the consumer/free-market and takes it away from Government. Rob: In your example, though, spending it outside of the country makes the nation’s financial woes even worse. The main point is that rearranging the taxes isn’t a fix. Reducing the burden is. A benefit of VAT over income tax is the introduction of greater consumer choice into their financial decision making. I cannot choose what to do with money that is taken from me by Government at the payroll stage (income tax) as I never receive it to be able to determine its use. For sure, in your example, if I want to purchase a $75 item on a $100 wage, then it makes no difference if I pay $25 income tax or add on $25 to the price of the item in VAT – my $100 is spent. But if I want to invest the money or spend it outside of the nation charging the VAT, then I am better off with lower income tax and higher national VAT.